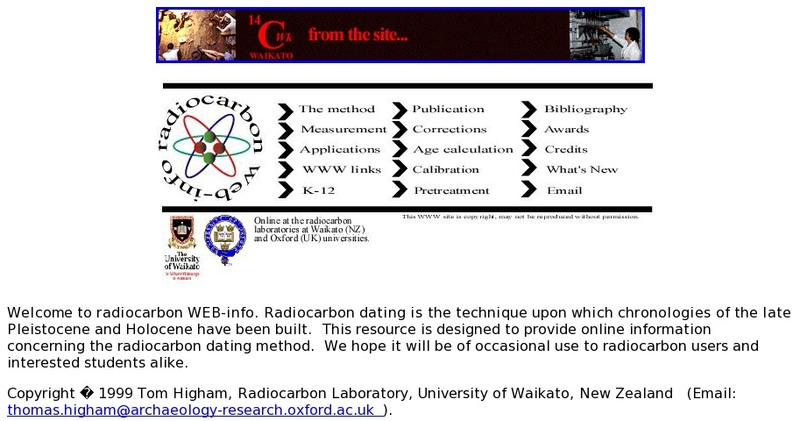 This resource contains reference materials on the radiocarbon dating method. Beginning with a summarization of the method, descriptions of three principal means of measuring residual carbon14 (c14) activity follow, including gas proportional counting, liquid scintillation counting, and accelerator mass spectrometry (AMS). External sites concerning radiocarbon dating applications are then indexed by discipline (i.e., archaeology, oceanography, paleoenvironmental studies, radiocarbon calibration and dendrochronology, and paleoclimatology). An international link list follows, connecting the user to various related servers and any of 29 different laboratories involved in such research as isotope measurement and AMS. An introductory FAQ page can be found on the K-12 page. The Publication page outlines the recommendations and standards for publishing radiocarbon dates, announces international radiocarbon conferences, and includes a link to the site for the journal Radiocarbon. The Corrections page describes the influence on radiocarbon from reservoir effects and recent anthropogenic disturbances such as the Suess (or industrial) effect and the atom bomb effect. Age Calculation provides access to a c14 dating calculator tool (by which remaining c14 can be derived from an input of years and vice-versa), and also provides background on such matters as modern standards, background counts, conventional radiocarbon ages, age reporting, standard errors, and accuracy and precision. The Radiocarbon Calibration page has background on calibration conventions, programs and curves, and typical ranges, while the Pretreatment page contains descriptions of commonly carbon-date materials, sample pretreatment, contamination, treatment assessment, and chemical and physical pretreatment methods. Finally, a bibliography contains recommended books and citations.